This story begins in 1964, when Maori found gold near the Taramakau River while looking for pounamu (greenstone). News soon spread, and the area’s population exploded. By the end of the year more than 1800 prospectors had arrived in the West Coast – previously home to only 100 Maori. Within another year, tens of thousands of diggers had gathered along the 180 mile stretch of gold-bearing country that has Hokitika at its centre. Initially the township was a sea of canvas tents housing thousands of people with no roads or streets, but by September 1865 Revell Street boasted 246 buildings, 67 of which were hotels. the threat of fire in the closely-built streets, led to the formation of the Hokitika Volunteer Fire Brigade in December 1865. Hokitika had become one of New Zeland’s most populous centres with 25,000 people by 1866. widely seen as a hotbed of sin and iniquity with few women and almost 200 pubs. Hokitika earnt its reputation as the capital of the lawless ‘wild West’. This new population was an eclectic mix of Australian, Irish, Scottish, Chinese and a myriad of other nationalities. At the peak of the rush it’s estimated that there were around 29,000 people on the West Coast. By 1867, Hokitika was New Zealand’s sixth largest town with the port ranking as the country’s busiest harbour. The first Hokitika Fire Station was built on Revell Street in April 1866 but was partially dismantled and shifted on rollers to Hamilton Street in 1869. This building didn’t last long however. During a severe thunderstorm in January 1875, lightning struck the bell tower next to the station and set it alight. Ironically, fire rapidly spread, and while the engines and gear were saved, the building was destroyed. The second fire station was completed by December 1875, supported by a smaller ‘no.2’ station in North Revell Street to house the manual pump and other gear. This served the Brigade for 32 years, until it was demolished and replaced in February 1907 by the third fire station. Plans for a fourth station first surfaced in 1936 but World War II intervened and delayed the building of number four until 1950. This fire station became the longest serving building of all, in active use for 53 years. It was sold for retail use in 2003 and became the Hokitika Fire Station Apartments in November 2018. The current Fire Station can be found outside the central business district – the end of an era for Hamilton Street – which has been the site of Hokitika Fire Stations for 134 years. 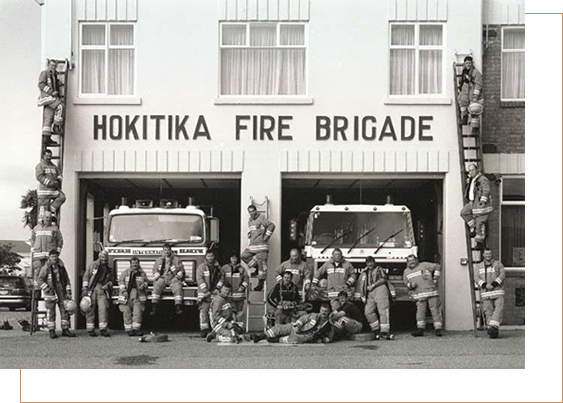 The Hokitika Volunteer Fire Brigade is one of the oldest fire brigades in New Zealand. Fire fighting in Hokitika has now spanned three centuries. This means that there are a few families in the district that have a significant association with the Brigade, including a large number of Gold Star member and life honorary members. The holiday apartments at the Hokitika Fire Station are proudly named after five of the nineteen fire chiefs to lead the Brigade to date. Captain Millard was the first captain of the Brigade, elected at its formation in November 1865. He was a painter by trade. The first Fire Station was built during his tenure and a hook and ladder purchased and shipped in from Ballarat in the Australian state of Victoria. Captain Millard retired from the Brigade in 1866. William Henshaw came to Hokitika in 1866 and earned his living as a carpenter. He had previous fire brigade experience having been the first captain of the Daylesford Brigade, Victoria, Australia from 1861. He left to return to Australia in 1867. Captain MacFarlane was born in Scotland but left with his brothers at the age of 20, bound for the gold rushes in California, United States and Victoria, Australia before following the rush to the West Coast of New Zealand. Macfarlane had previous fire brigade experience with the West Ballarat Brigade, Victoria, in the early 1860s and was elected to lead the Hokitika Brigade in 1867. He presided over a number of improvements including the relocation of the first station to Hamilton Street. MacFarlane served as Captain until 1873, when he left to become resident magistrate at the ill-fated Government settlement at Jackson Bay. Captain Shain’s tenure began in 1873 and was interrupted briefly in 1876 when James Holmes took over. Shain saw to the building of the second station and tower. He was a popular leader but died unexpectedly in 1881 while still Captain. The Brigade collected donations and contributed money towards the coast of a memorial stone for his grave. The resulting grave marker still stands in the Hokitika Cemetery with the helmet and axes emblem carved into the top. Superintendent Thompson joined the Brigade in 1886. He served as Lieutenant under Captain Michel for five years and became Superintendent upon his retirement in 1908. While he resigned in 1911 as Superintendent, Thompson remained a Brigade member until he received his Gold Star.